Supreme Court has cleared the way for the release of Sanjay Leela Bhansali’s period film..
NEW DELHI: Sanjay Leela Bhansali’s “Padmavati”, which is held up in India over protests and..
Padmavati may not release this year amid controversy. 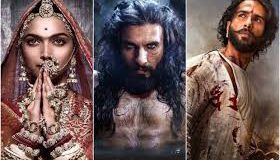 Mumbai: The release date of Sanjay Leela Bhansali’s magnum opus Padmavati starring Deepika Padukone, Shahid.. There is not stopping for the recent release of Deepika Padukone, Ranveer Singh and Priyanka..
Tamasha’ is about life, about the Shakespearean notion of us human beings being mere actors.. The much-awaited trailer of Sanjay Leela Bhansali’s Bajirao Mastani was released on Friday. The veteran..
Ranbir Kapoor-starrer “Bombay Velvet” has failed to displace Deepika Padukone’s simple, subtle and meaningful act..
New Delhi: After the success of recently released film ‘Finding Fanny’, director Homi Adajania is..